The rise of artificial intelligence is changing the world and has the potential to transform our future. This tech phenomenon raises the age-old question about how to tackle the change and not ignore its impact on people and their lives. 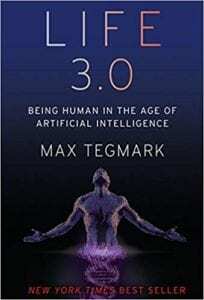 Professor Tegmark covers these topics from various angles, including the impact of AI on people, behavior, expectations, laws, jobs, weapons and, finally, the roles people play in our society. Starting in the present, his book takes readers to not only the near future but also 10,000 years from now, generating ideas and potential dialogs around what we need to do now in order to improve our future and not allow technology and AI to destroy the universe. Welcome to the most important conversation of our time – This opening sets the stage for the book by discussing why AI is suddenly on everyone’s radar and is very likely to be extremely important over the coming decades. Matter turns intelligent – Provides definitions on intelligence and lays the groundwork for the question of what happens as artificial intelligence grows ever more powerful. The near future: breakthroughs, bugs, laws, weapons and jobs – Addresses questions of what happens in the near term as more and more human jobs can be done by AI. Intelligence explosion? – This chapter explores the exciting – and potentially terrifying – aspects of the impact of AI. Aftermath: the next 10,000 years. Our cosmic endowment: the next billion years and beyond. Goals – Explores the goals of individual, society and machines. Consciousness – Looks at such questions as to whether we can design machines with consciousness. Tell us what you think: PULSE wants to hear what you think of this book. Share your review with us at pulse@iaop.org.